Rating: [M] Violence & content that may disturb. Aroview: A fun, big-budget monster movie featuring an extraordinarily intelligent silverback gorilla who mutates into a raging creature of enormous size due to a failed genetic experiment. 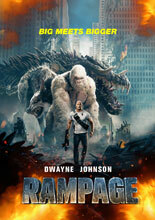 Dwayne Johnson plays the Primatologist who attempts to restore his friend and save the world. Loosely based on the video game of the same name.